Good morning from the lone star state! I made it back to Texas! It’s a bit hotter down here, but otherwise Teddy and I are enjoying being back home (Teddy was born in Texas). 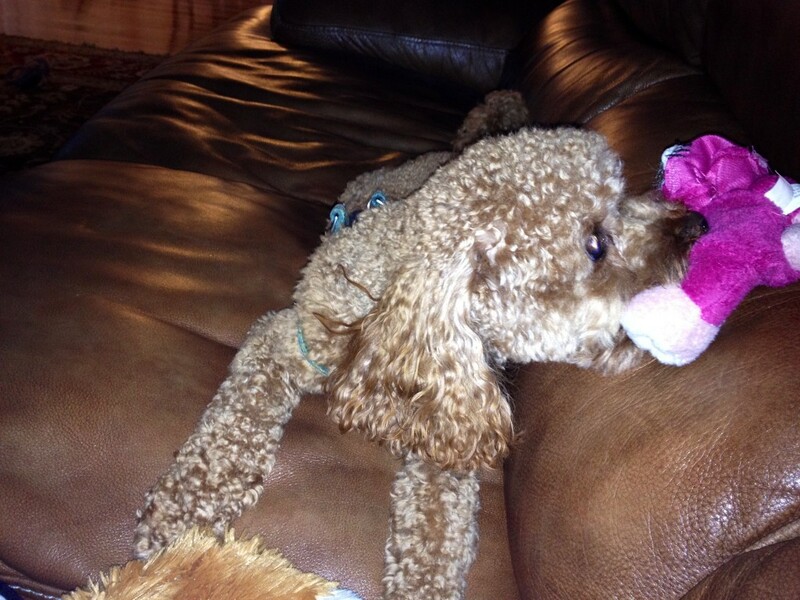 Teddy is having a ball having more people and another dog around. So far, he’s managed to take the stuffing out of about five of Sophie’s (my parent’s dog) toys in the course of about an hour. He chooses a new victim every 10 minutes or so. He thinks it’s Christmas because he has 30 new toys at once! Whole Wheat Strawberry Banana Bread! I originally saw the recipe for this delicious bread on Daily Garnish and have wanted to make it ever since. 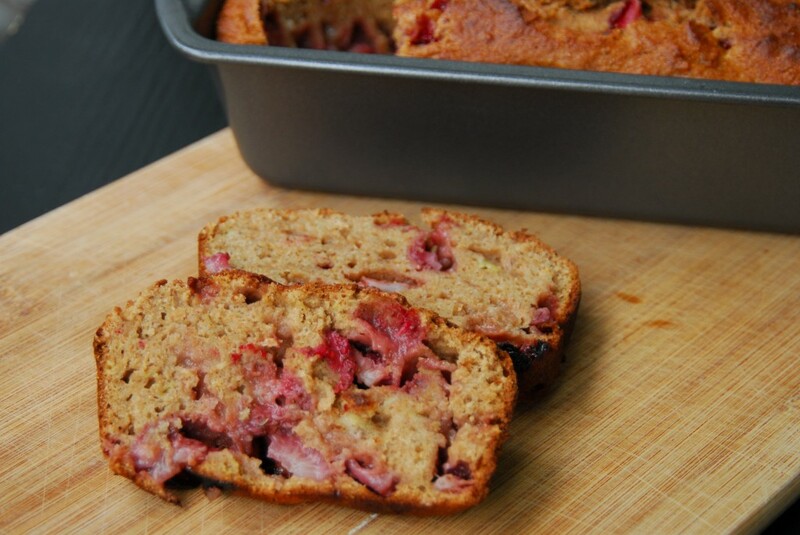 I am a huge banana bread fan and love the strawberry banana combination in my smoothies. I don’t know why I never thought to add strawberries to banana bread! 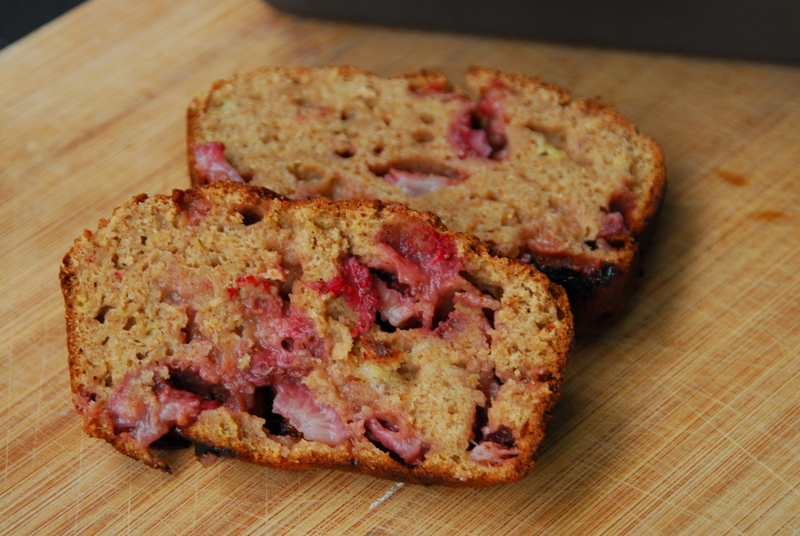 It is an extremely tasty enhancement to banana bread, and strawberries are still in season for a little while longer! This makes such a great breakfast and is a nice and healthy snack too. You could adapt any banana bread recipe and add some chopped strawberries, but I went off of Emily’s because she always has great healthy recipes on her blog. I substituted and used all whole wheat flour. Some people don’t like the texture of baked goods that exclusively use whole wheat flour, but I think it’s just as good! It’s a pretty simple recipe. The hardest part is having the delicious scent of banana bread permeate your house and have to wait 45 minutes until it’s baked to eat it! First, preheat your oven to 350 and chop your strawberries into bite sized pieces. Then mix the dry ingredients together in a large bowl. In a separate bowl, mash the bananas with a fork until they are fairly smooth. 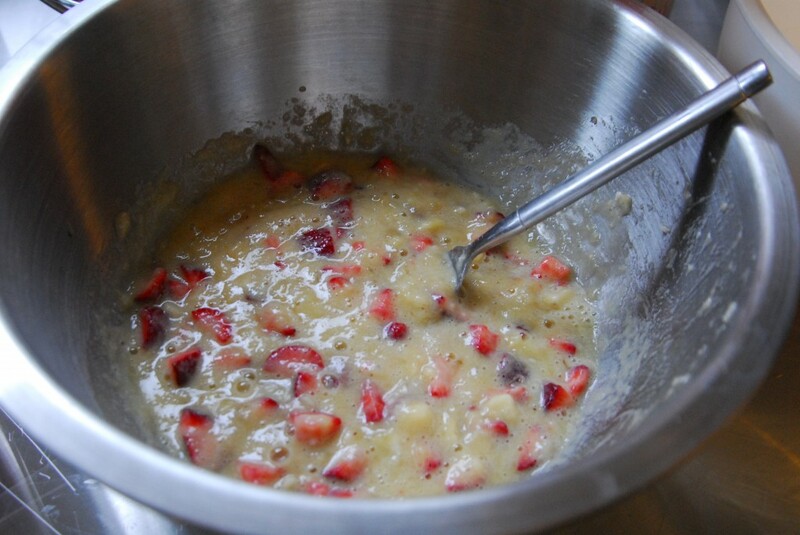 Add the rest of the wet ingredients to the bananas along with the chopped strawberries and stir to combine. 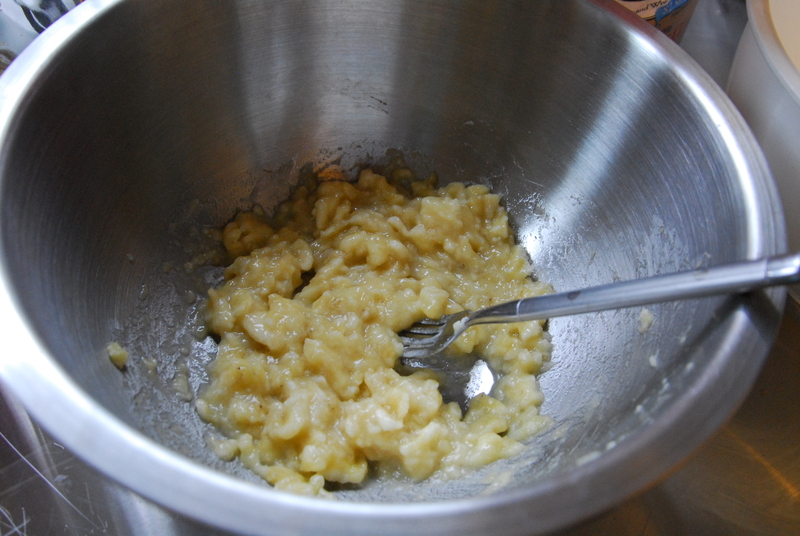 Then add the wet ingredients to the dry and stir until just combined. Pour into a greased bread loaf pan and bake at 350 for 45-55 minutes, until an inserted toothpick comes out clean. 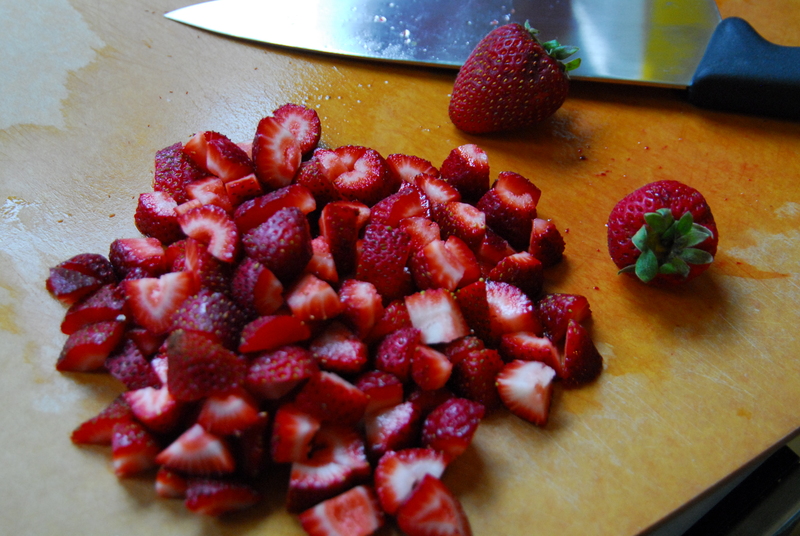 Chop up your strawberries into bite sized pieces. 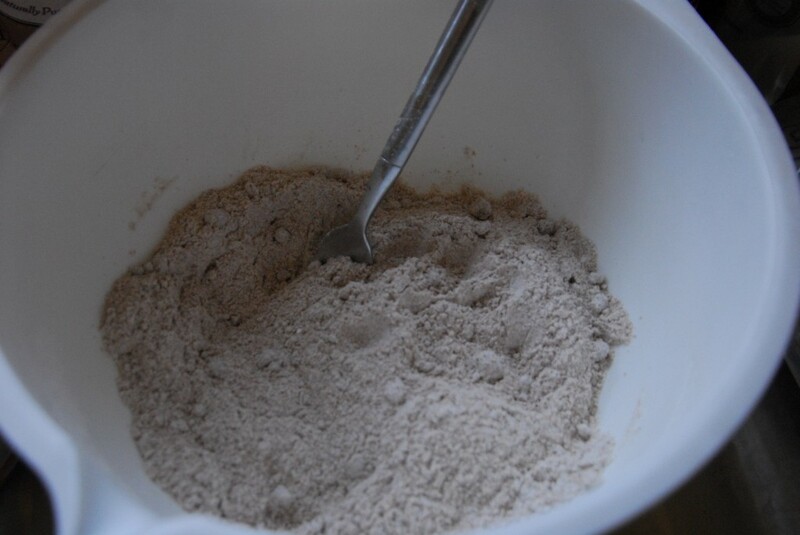 Mix together the flour, baking soda, salt, brown sugar and cinnamon in a large bowl. In another bowl, mash the bananas with a fork until they are fairly smooth and creamy. 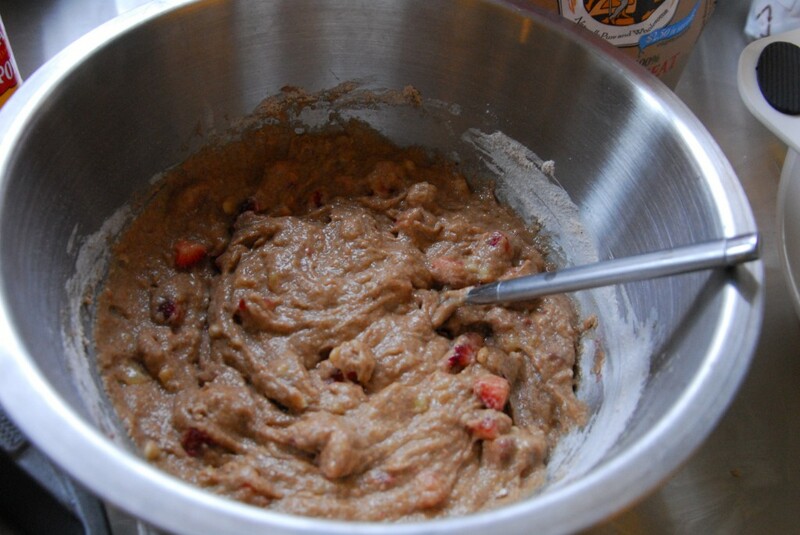 Then mix in the applesauce, eggs, vanilla and chopped strawberries. 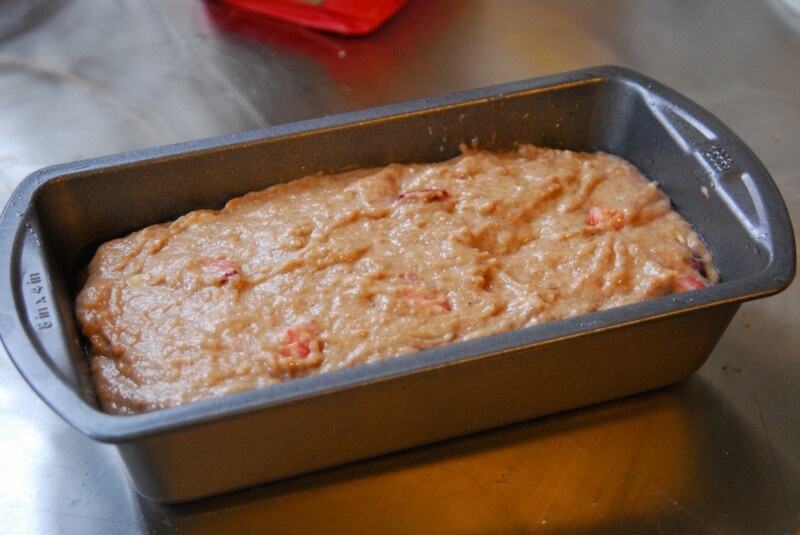 Pour into a greased bread loaf pan and bake at 350 for about 45-55 minutes. Mine was done at 45 minutes, so keep an eye on yours! When the bread is done, an inserted toothpick will come out clean. Let cool for at least five minutes and enjoy! This entry was posted in Breakfast, Recipes, Snacks and tagged bananas, bread, breakfast, Snacks, strawberries. Bookmark the permalink. Yumm this is my kind of bread, I have made something similar before and love it soo much! My coworkers have been giving me a hard time about slacking on the baking-for-the-office bit lately – this could be just the thing to satisfy everyone! I can only imagine it warm, with our first cup of coffee…looks wonderful! Haha I want to work in your office! I am such a strawberry fan, I can dominate a whole container by myself. I love it! So healthy and delicious! Hi, Caroline! Welcome back to Texas! You sure are spoiling Teddy aren’t ya! 3o toys?! ;). I’m def pinning this one! 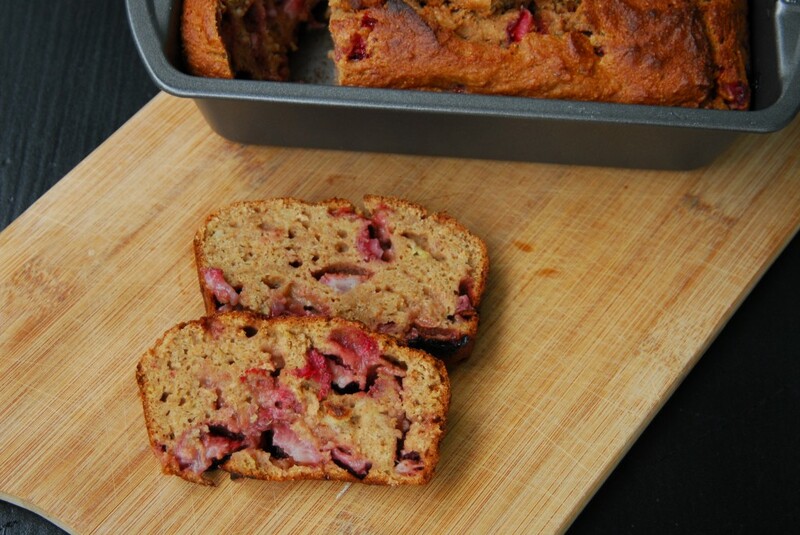 Love banana bread but never have I ever thought to add strawberries! Yum! Banana bread (and any variation of it) is my favorite sweet bread, hands down (I’m sure I’ve told you this already), so I always get excited when I discover a new variation. I thought I’d seen them all, but I don’t know that I’ve ever come across a recipe that incorporates strawberries into the batter. Yum! One of my favorite twists is peanut butter banana bread (of course), and I bet that would be amazing with strawberries as well! 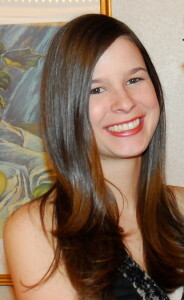 Sara @ Nourish and Flourish recently posted..Healthy Living, Hugging and Eating in Boston! I bet my Mom would love peanut butter banana bread! I had orientation yesterday and school starts Monday! Aww I love little Teddy! I also love trying new breads, so this looks great! This recipe looks so good! I love anything strawberry-banana! This bread looks and sounds amazing with strawberries! !